A line of American tanks. Note that units have been stricken in the caption. Official caption: "6AG 7A-27826/ETO HQ 44 29297 12 Dec. Credit...U.S. Army Signal Corps. Photog--Pvt. Francis E. Lane...163. 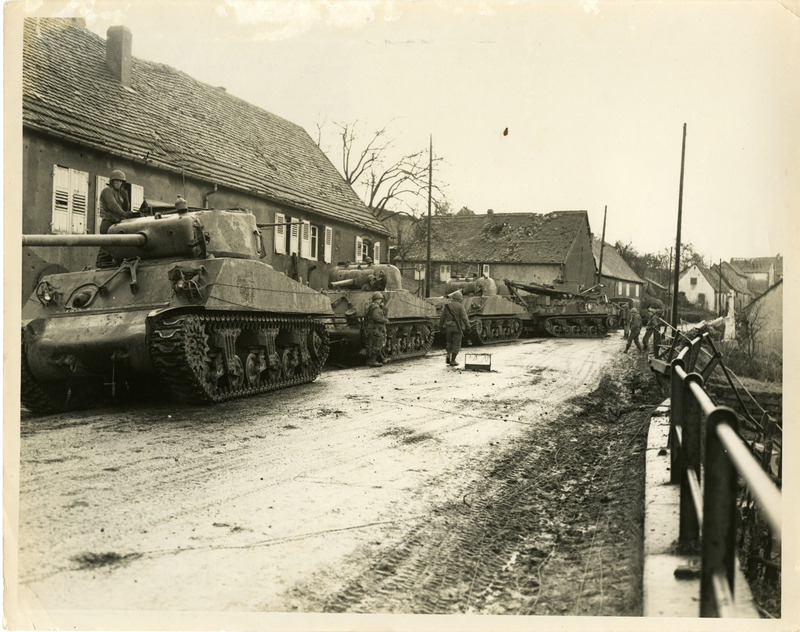 This line-up of American tanks is ready to help pull one of the battalion tanks out of a roadside ditch near Lemberg, France. The tanks are tied together for additional strength on the job. Ditched tank not in photograph. (B). 781st Tank BN, 100 Div., Lemberg, France." Passed for publication as censored on 14 December 1944; passed for publication without censorship restrictions by SHAEF Field Press Censor on 16 April 1945. Photographs from the service of Allan Voluck, who served as a photographer with the 3908th Signal Service Battalion in Europe.